Several years ago on the evening before the New York City St. Patrick’s Day Parade I had the opportunity to attend the Grand Marshall Ball. Prior to this, the extent of my parade participation was an annual lunch-hour walk to Fifth Avenue for a glimpse of this grand and festive tradition. As you navigate your way through the crowds that cover every square-inch of the sidewalk along this famed stretch of avenue, you could hear it – the bagpipers, the bands; you could sense it – the pride of the participants; and along with tens of thousands of others, you could be witness to it, the enormity and glory of the day. 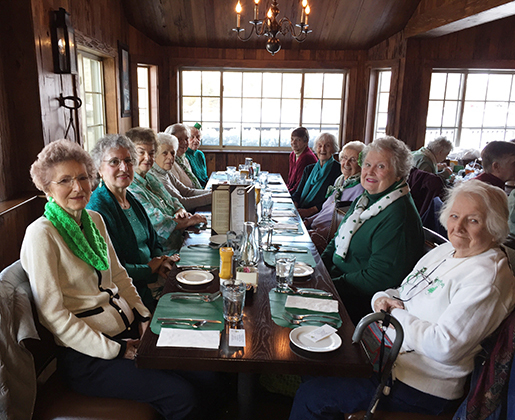 Each – the dinner and the parade – an experience like no other. 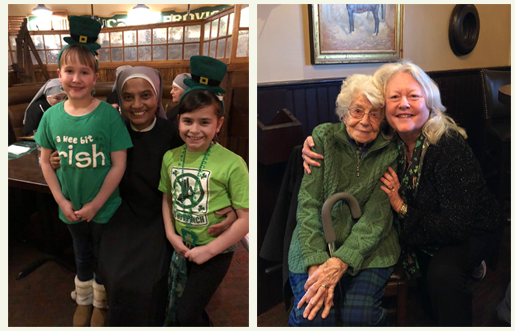 All that said, the Little Sisters of the Poor 10th Annual St. Patrick’s Day Dinner at The Old Grist Mill Tavern was also an experience like no other – an enormous undertaking and a grand and collective effort on the part of so many. 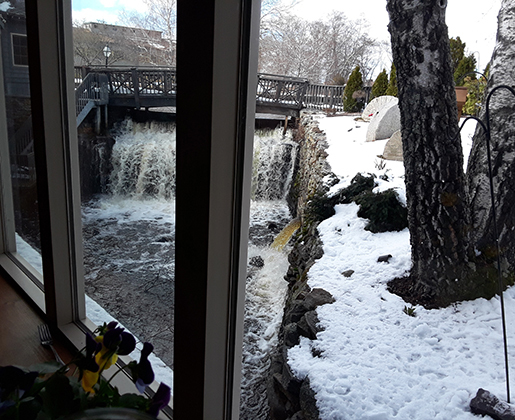 * The Old Grist Mill Tavern: Greg Esmay, proprietor, and his family and staff who for ten years have generously dedicated their time to host this all-day affair in a most delightful and unique environment. 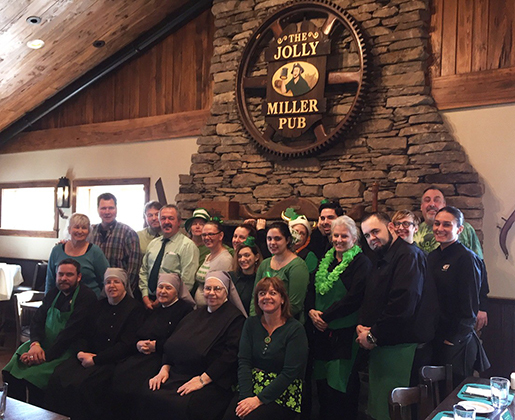 Service with a smile and all day long from 10:00 a.m. to 10:00 p.m., it was a choreography of managers, hostesses, waiters and waitresses, bartenders, cooks and food preparers, all generously donating their time. The warmest welcome they gave to each of our guests, all to support a cause that means so much to Greg and his family. 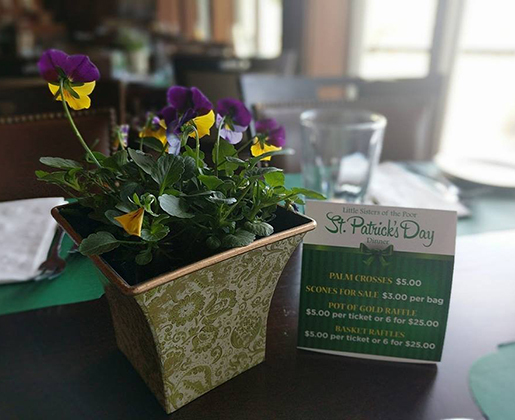 Thank you everyone at The Old Grist Mill Tavern! 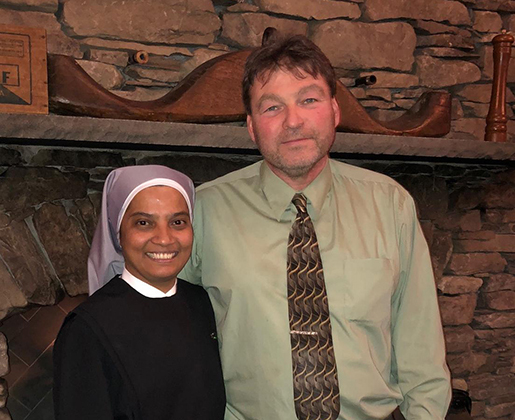 * The Guests: more than 850, who, after digging out from Nor’easter #3, ventured out on a breezy, chilly winter day to join us for this annual tradition, each one happily attending to support the good works of The Little Sisters of the Poor. For some this was year ten, for others a first but with a promise to join the fun next year and beyond! 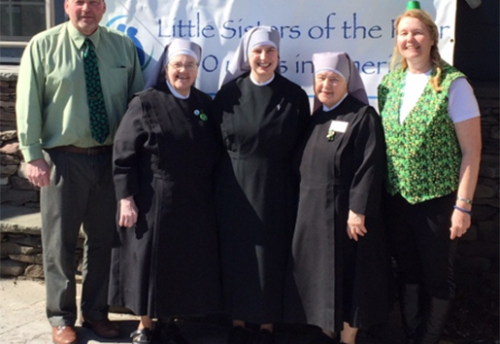 Thank you to our guests, each and every one a good friend of The Little Sisters! 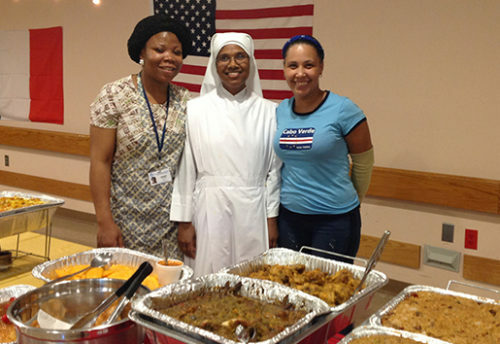 * The Volunteers: a varied and dedicated group, 35 in all, including the Navigant Credit Union VForce, Bryant University Campus Ministry, Association Jeanne Jugan, Residence Volunteers, and members of the Little Sisters of the Poor Advisory Council joyfully assisting in the kitchen – preparing salads, slicing pie, scooping ice cream; in the dining room – clearing and setting tables; and at the registration table – selling handmade Palm Crosses, delicious scones and raffle tickets. Thank you to our volunteers! 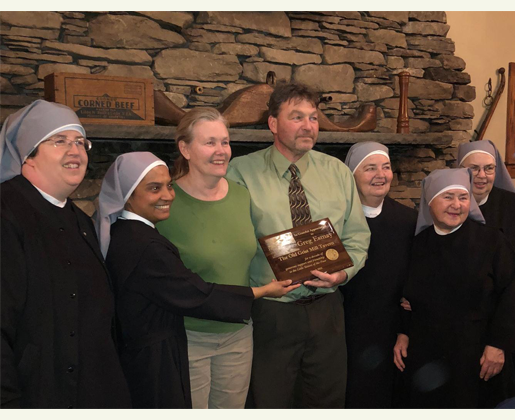 * The Friends and Donors: the 900 pounds of corned beef, the cabbage, the vegetables, the soup, the salad, the condiments, the pies, the ice cream, the cookies, the coffee, the sugar, the creamers, the flowers, the placemats, the napkins, the aprons, the plaque makers, the graphic artists, the printers, the mail-house, the musicians, the raffle prize donors, and dozens of friends of the Little Sisters who could not attend but who participated through generous and outright contributions. 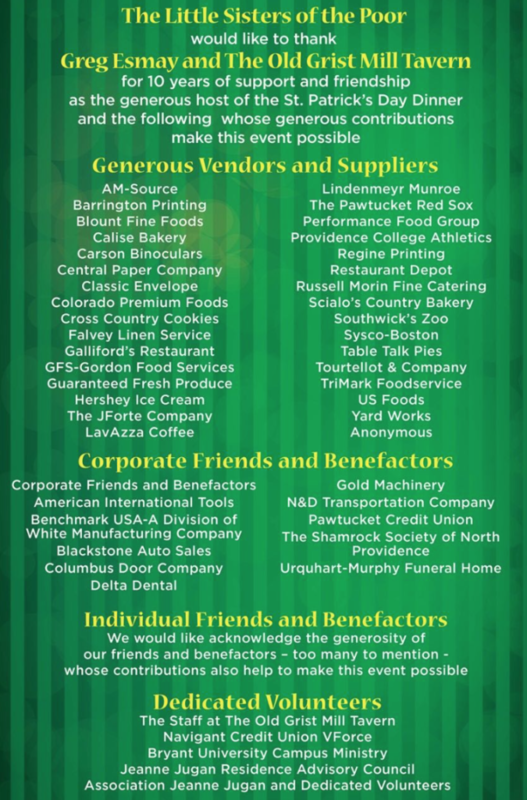 Thank you to our donors! 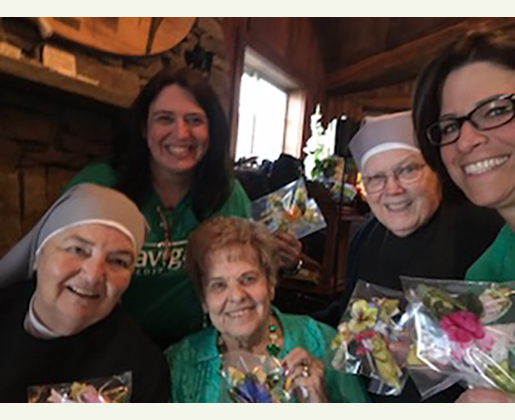 * The Little Sisters of the Poor – their months-long collection of donated goods from vendors throughout the state and beyond, their creative encouragement toward the production of nearly 200 hand-made and delicately fresh Palm Crosses, stunningly beautiful and an important reminder of this Holy season, their support of the kitchen staff as they mixed, baked and packaged the ever-popular scones, 500 bags in all (2000 scones total) but mostly, their warm and welcoming presence, and prayerful appreciation of each and every individual who worked so hard toward the success of this annual event. 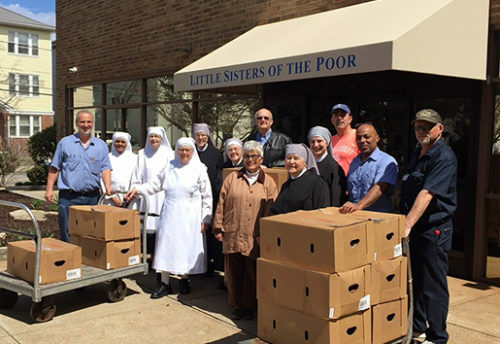 Thank God for The Little Sisters of the Poor.